Mary Ramirez Taconi is a first generation Mexican-American. She was born and raised in a bustling home filled with 5 siblings and 5 foster sisters in Gary, Indiana. She is a graduate of Andrean High School and Stone School of Business in New Haven, CT.
Mary’s first job was as a showroom manager for a company located in the Chicago Merchandise Mart. Her most recent employment was with Trinity Orthopedics at West Suburban Hospital, Oak Park. Mary is married to Joseph B. Taconi, Jr., a life-long resident of Melrose Park whose grandfather founded the Asso Appenni Society. They are proud parents of 3 children who are graduates of Fenwick and Montini High Schools. Their 2 daughters are graduates of the University of Illinois at Champaign and their son is in his last year of studies at Kendall College in Chicago. For 14 years, while her children attended St. Luke Grammar School, Mary volunteered her time and efforts at the School, serving on both the Women’s Guild and the School Board, chairing fundraisers, organizing dinner dances, and performing clerical services. After her children graduated, Mary brought her energy and enthusiasm for volunteering to the high school arena, where she was active in the Fenwick Mother’s Club, chairing their raffle committee, and serving as a class representative. 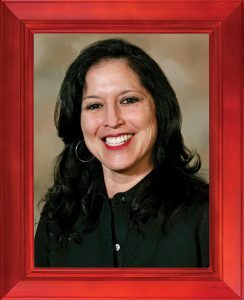 Once her children were settled in high school, Mary Ramirez Taconi was able to realize some of her own aspirations and began to vigorously pursue those interests. She served 2 terms on the Melrose Park Library Board as an appointed board member. Next, Mary focused on the Village and how she might make it an even better place to live. Mary was elected a Melrose Park Village Trustee, where she has served with vision and leadership for 3 terms.